Despite a report from the Lubbock Avalanche Journal saying Leach is “interested in returning to Tech” in the wake of Kliff Kingsbury’s firing, the Cougars coach said that's not the case. Mike Leach says he has no interest in leaving Washington State for his former school, Texas Tech, despite a Sunday report from the Lubbock Avalanche-Journal that claimed such a move would be of interest to the seventh-year Cougars coach. Leach, in the past 24 hours, has told multiple reporters he wouldn’t be remotely interested in leaving Pullman for Lubbock, citing his frustration that Tech still hasn’t paid him for the 2009 football season, while also suggesting he’s perfectly content at WSU on the heels of a 10-victory regular season. A Sunday report from the Lubbock Avalanche-Journal cited two sources that said Leach is “interested in returning to Tech” in the wake of Kliff Kingsbury’s firing. A former quarterback for Leach at Tech, Kingsbury was dismissed Sunday after finishing 5-7 with the Red Raiders and missing out on postseason play for the fifth time in seven years. The Avalanche-Journal story also reported a source saying, regarding rumors of Leach’s return, that a large contingent of donors will lobby athletic director Kirby Hocutt to make it happen. The Cougars, ranked No. 12 in The Associated Press Top 25, are coming off a 10-2 regular season – Leach’s best record in Pullman and WSU’s highest victory total in 15 years. But Leach is still outraged at the school that fired him in 2009 and has gone as far as to call Texas Tech administrators “felons” and “crooks” for not paying him the $2.5 million he believes he’s still owed for leading the Red Raiders to a 9-4 record his last year in charge of the program in Lubbock. The other source told the newspaper a separate group of donors wouldn’t endorse a move to bring back the coach who stirred up national controversy that he allegedly mishandled an incident with former Red Raiders player Adam James. The player’s father, former ESPN analyst Craig James, claimed Leach mistreated his son by ordering him to stand in a dark equipment room while dealing with a concussion. Tech terminated Leach in December of 2009 and when the coach filed a lawsuit against the school after Tech refused to pay out the remainder of his contract, an estimated $2.5 million, the state of Texas cited a sovereign immunity law that shields state institutions from being sued for monetary damages. But Leach, who went 84-33 in his 10 seasons at Tech and led the Red Raiders to an 11-2 record in 2008, has been persistent in pressuring the school to pay him the money he’s owed. The WSU coach berated his former employer in a news conference last season. 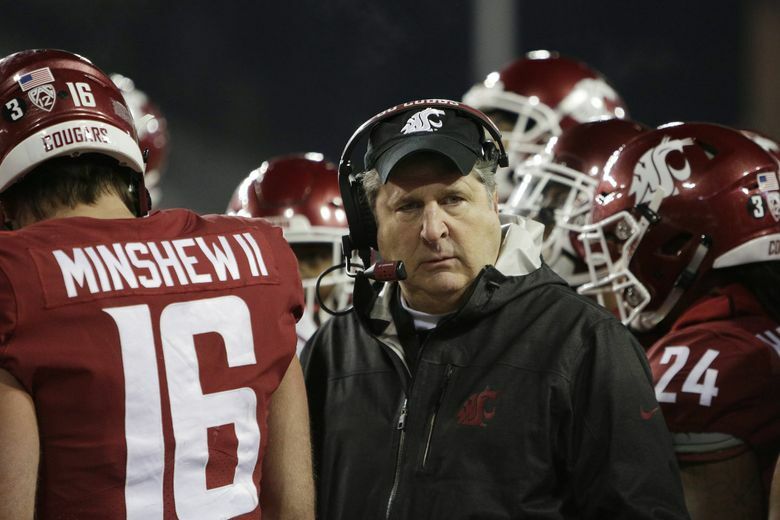 Leach has turned around the program at WSU, leading the Cougars to an unprecedented fourth consecutive bowl berth in 2018. No school in the Pac-12 has won more conference games over the past four years than Leach’s Cougars, who’ve gone 26-10.